Scottie Pippen sealed it: His Houston Rocket career was a complete and total failure. After unloading a vicious and brutal verbal attack on Charles Barkley on Wednesday, the Rockets sent a message back to Scottie on Friday: Get the hell out of our town. The Rockets sent Scottie to the Portland Trailblazers on Friday for 6 players off the end of the Blazers' bench. Kelvin Cato, Walt Williams, Stacey Augmon, Ed Gray, Brian Shaw and Carlos Rogers all come south to Clutch City, while Portland becomes "Pip City". Rudy T was the one who made the call, telling Pippen he'd been traded. "It was very professional," said Rudy. "We wished each other luck, sorry it didn't work out and let's push forward." When asked if he tried to make the relationship with Pippen work, Rudy replied, "It's a moot point. We're moving forward. ... I think we've taken a negative situation and tried to turn it into a positive." Sir Charles also took the high road Thursday in his comments back at Scottie in the press, but you'll be happy to know sources indicated to us that initially Chuck was shocked to hear of Pippen's comments, then tried to call Scottie to say the two words that begin with a 4-letter verb and end in "you". I'd pay good money for a transcript of that conversation. But we'll get to Scottie later. Instead lets focus on what the Rockets receive in this deal. The initial reaction is this was a lopsided deal in favor of the Blazers. They gave up 6 players -- all on the very end of their bench -- and got a future Hall of Famer/Dream Teamer/6-time champion in return. But was it anymore lopsided than the deal the Rockets gave Scottie Pippen? If the Rockets got a raw deal, they got it from Mr. $15 million per year, not from the Blazers. The lone problem I have with this deal is the Rockets decreased their chances to win a championship because they increased the Blazers' chances. You never make a deal with a contender/rival in your conference, but they went against the grain on that one. That is the only thing that irks me: That Scottie got to go to a championship-caliber ballclub. As for what we got, the fact that 3 of the Blazers the Rockets received are expected to be solid contributors for Houston is a testament to how deep the Blazers are/were. We start with Kelvin Cato. The 6'11", 255 pound center/power forward is a fantastic shot blocker. Over his career using a per minute basis, Cato blocks 4.68 shots per 48 minutes. Compare that to Dikembe Mutombo (4.71), David Robinson (4.4) and Hakeem Olajuwon (4.27) and you realize this guy can stamp 'return to sender' on some of those drives to the basket. 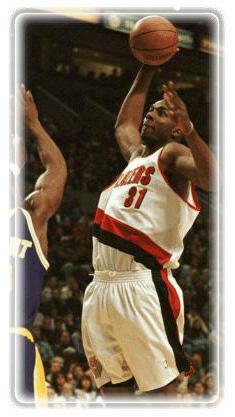 In particular we recall Cato giving fits to Karl Malone in several Portland-Utah games. He's a very good defender, but also gets into foul trouble easily. But he is still a very raw player, and according to some, was disappointing in summer league games. He is not an offensive player (as evidenced by his 3.7 points per game), hitting just 43% of his shots and just over 62% from the free throw line. Neither percentage very good for a front court player. But keep in mind he's played under 14 minutes per game for his career, and has been stuck behind some good frontcourt players in Portland. The good news with Cato is if the Rockets can develop him into a slightly more versatile player, his trade value increases greatly, as size sells in the NBA. However, I expect Cato to be a significant part of the Rockets youth movement as he just recently turned 25 years old. Walt Williams should have the biggest immediate impact on the Rockets, and all indications are he will be the starting small forward on opening night. The 29-year old 6'8" small forward known as the "Wizard" can light it up, and was 4th last year in the league in three-point percentage hitting almost 44% from long-range (43.8%). To put that in persepctive, Michael Dickerson led the Rockets and was right behind the Wizard at #5 last year in the NBA with 43.3%. Keep in mind, Pippen played practically twice as many minutes per game as Williams. You lose rebounding, assists and defense, but if your concern is offense, you probably shouldn't be too worried. Williams hit better from three-point range than Pippen did from the field. Then again, Pippen shot better from the field than Williams did from the field. Talk about wild. Don't get me wrong. On talent levels I'd much rather have Scottie, but Williams will do an admirable job in the small forward slot. The Rocket future doesn't look good for Ed Gray, Brian Shaw, Carlos Rogers and according to some, possibly even Stacey Augmon. Gray had a good rookie season in Atlanta, but has been disappointing since and had a brush with the law as well (which made him a good fit in Portland). The 6'11" 220 pound Rogers is best known as the player who was willing to sacrifice his NBA career to give his kidney to his dying sister. Unfortunately she was in a state where she couldn't take the surgery and died shortly after. 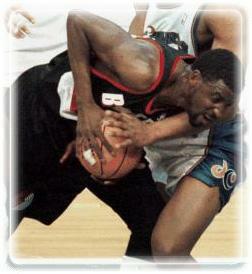 His best season was 1996-97 in Toronto where he averaged nearly 10 points per game. Brian Shaw is probably best known to Rocket fans as a member of the Orlando Magic when the then Shaq-led Florida club challenged the Rockets in the 1995 NBA Finals. Shaw was a significant contributor then, but has nearly dropped off the face of the earth since. Augmon however is a bit of an enigma. He's an excellent one-on-one defender, and it would seem the Rockets would be interested in keeping Augmon for that very role. But ESPN suggests the Rockets will cut Augmon, as well as Gray, Shaw and Rogers, and Augmon will sign back with the Blazers for a smaller salary than he is currently being paid ($3.2 million). We certainly hope that's not the case as our opinion is Augmon could be a solid role player on the team. Hopefully we'll know more on that shortly. There are reasons this deal was made. The Rockets must find chemistry on the court, and hopefully there will be some good vibes now that Quitten is off the team. There was just no way they could go into camp with him on the roster after the comments he made. With the malcontent gone, the Rockets can focus on getting on the same page. Money was a big one. Les wasn't happy one bit with Scottie's performance/comments/attitude, and I can't say I blame him for wanting to get out from under that ridiculous contract. The Rockets' hands would have been tied in so many respects as far as free agents and trades are concerned over the next 3-4 years that it only made sense to unload him. At the same time, I suspect the Rockets were looking for a justified reason to unload him, and Pippen more than gave it to them. The Rockets may have taken a step down in talent, but if there is anything we've learned over the years it's you must have a cohesive group that plays well together. I can't guarantee the Rockets are going to have that chemistry, but Cuttino Mobley wants to be here, and all indications are he's going to be a great one. Steve Francis wants to be here, and every thing we see on his play leads us to believe he is going to be the real deal. Shandon Anderson wants to be here, and he more than proved that by taking substantially less to come here. He's going to be a big fan favorite in this city. Williams and Cato I'm sure are ecstatic about seeing more playing time and Charles Barkley no doubt is motivated to show up Pippen. Hopefully Hakeem will show that fire as well. We thought last year was the big turnover year and the Rockets would be trying to take advantage of the familiarity factor, but out are Pippen, Dickerson, Othella Harrington, Brent Price and Antoine Carr ... probably Sam Mack too. That's a huge chunk of last year's roster. It's going to take time, but the youth movement (Cato, Mobley, Anderson, Francis, Bryce Drew and Kenny Thomas all 25 or younger) has started and there is some talent in there. I am completely tired of listening to some try to defend Scottie Pippen. Scottie committed a cardinal sin by callously blasting a current teammate for the world to hear and see. He blamed everything on Charles Barkley, a teammate who made several sacrifices for Scottie to come here and defended him after every 4 point, 5 turnover performance Scottie upchucked. How ironic that Scottie said he was only going to the Rockets because of Barkley, and called Chuck constantly last summer to make sure he would be on board before committing to Houston. Now, Charles is the entire problem. And let me ask: Did this have anything to do with Charles Barkley? If the Rockets had immediately announced they had no intentions of bringing Chuck back, would this have satisfied Scottie? Would it have made the Rockets a better team? An emphatic 'no' on both accounts. Scottie used Barkley to look justified. He wanted Phil and LA, nothing else. He knows there are many anti-Barkleyites out there in the world. Could you imagine Scottie making those comments about Olajuwon or Michael Jordan? And who is he going to blame in Portland? Barkley said some weeks back that we would know more about Pippen's character if he was traded, and he was dead on. Scottie failed miserably. He's shown he's not a leader. He's shown he can't take the pressure of being "The Man". He's shown he's all about finger-pointing and laying blame elsewhere. Scottie Pippen is a very good $2 million/year sidekick to Mr. Jordan, and nothing else. His 6 championships alongside Michael mean nothing. After just 50 games in which he proclaimed he would lead the Rockets back to the Promised Land and how he wanted to finish his career in Houston, he quit on the team. He's a complete failure as a leader and a teammate. I'm embarrassed Scottie Pippen was ever a Houston Rocket. It makes you feel almost dirty, like a bad stage in your life where you experimented with illegal drugs or dated some girl you had no idea worshipped "Jiffy the God of Peanut Butter". Every day is a good day because it's a day without Scottie wearing the uniform. And I ask, does anyone feel any more animosity towards JR Reid for that blatant takedown of Scottie in Game 4 of the Lakers-Rockets series last season? I don't... in fact I'm thinking about sending him a beer in Milwaukee. The Rockets have 18 players under contract, and that's not including what to do with free agent Sam Mack. The Warriors are in constant contact with the Rockets and are flexible on a sign and trade, but they don't want to take on some of the cap dead weight the Rockets want to throw in to make a Mack deal. Don MacLean, Matt Maloney and Matt Bullard are all available. There continue to be whispers of talks with the Detroit Pistons and Miami Heat, with names like Derek Harper and Voshon Lenard being thrown around, but nothing concrete. The Rockets will hopefully be able to make a 2 or 3 for 1 type of swap however as they simply have too many. Carroll Dawson said he'd like to have 15-16 on the roster by the end of training camp, so we may not see moves right away. Overall, I like the deal. It's frustrating we couldn't get more, but I'm happy with Pippen gone. We got deeper with this deal and more cap flexible. A contract like Pippen's is no longer weighing us down when considering future moves. Training camp is upon us and I'm pumped about the season. The odds are against us and the experts aren't picking us. Hopefully, like the Rockets of old, that will bring out the best in these guys. 10/2: "Thanks for nothing, Scottie"